Typhoid in infants often remain unrecognized due to atypical clinical picture. The infants are more susceptible to typhoid as has been revealed by various studies. The Typhoid Vi Conjugate vaccine have been demonstrated to include ‘T’ Cell dependent response with much higher antibody. The conjugate Vi antigen vaccine also elicits booster response as is common to all conjugated vaccines. A clear to slightly turbid solution containing purified Vi capsular polysaccharide of Salmonella typhi (Strain Ty2) conjugated with Tetanus toxoid protein for prevention of typhoid fever. One dose (0.5 ml) contains: 5 µg of Vi polysaccharide of Salmonella typhi (Strain Ty2) conjugated to 5 µg Tetanus toxoid protein in isotonic saline 0.5 ml. Peda Typh™ is indicated for active immunization against Salmonella typhi in infants of age ? 3 months, children and adults. In the event of fever or severe infection, persistent diarrhoea and vomiting. Inject 0.5ml intramuscularly. Do not inject intravenously or intradermally. Prevention becomes effective 4 weeks after immunization. One dose followed by booster after 2½-3 years of primary vaccination. Vaccination can be done from 3 months age onwards . As for any product, there may be more or less moderate and temporary side effects like: – Pain, induration, erythema, purities at the injection site. – Rare, transient febrile reactions. – Paracetamol or Ibuprofen cover for 36 hours after vaccination shall decrease the intensity of side effects. Store between +2° to +8°C in the refrigerator. Do not freeze. One dose in prefilled syringe. The shelf life of the product is 36 months from the date of manufacture if stored at recommended storage conditions. The studies were undertaken to assess the immunogenicity and safety in infants and older children of a new vaccine-Vi polysaccharide conjugated with Tetanus toxoid protein. This new technology has avoided the use of recombinant proteins for conjugation. The vaccine has passed the required safety & immunological parameters in animals. The permission to conduct clinical trial Phase III in human was cleared by the Drugs Controller General (India) after necessary evaluation. Open , multicentric, controlled & comparative study was undertaken. The three consecutive batches of Vi conjugate typhoid vaccine (Peda TyphTM), used for conducting the clinical trial, were found to be of standard quality by Central Drugs Laboratory, Central Research Institute, Kasauli, H.P. of Government of India. The Vi polysaccharide typhoid vaccine manufactured by BIO-MED (P) LTD., was also tested for comparative assessment studies. The study protocols were approved by the ethics committee of eminent medical colleges located in three widely separated zones of India. Based on the above data, the principle investigators concluded that Peda Typh™ (Vi Conjugated Typhoid vaccine) was safe & well tolerated in all age groups including infants. Blood samples(1-2ml) were collected by venipuncture before vaccination on day 0(pre-immune) and 4 weeks after vaccination (post immune). lgG anti Vi antibodies were detemined by ELISA. ELISA test : (Assay for assessment of immune response in paired serum samples) ELISA test kit was validated and calibrated as per the guidelines of good laboratory practice. Serum lgG Vi antibodies were assayed by ELISA and expressed in ELISA units relative to a standard reference. The unitage of the standard reference was assigned by NICHD, NIH, USA. Preparation of standard reference curve and calculation of lgG antibodies was done by program of ELISA version 2.0, Centers for Disease control , Atlanta(USA). Biostatistical Analysis : Biostatistical analysis of the clinical trial of Peda Typh™ was done by Dr.R.M. Pandey Ph.D.,FRSS(U.K.),Professor and Head, Department of Bio-Statistics, All India Institute of Medical Sciences ,N.Delhi. Biostatistical analysis proved that Peda Typh™ vaccine is safe and immunogenic. The antibody titers of the sera from 100% of the subjects (from all three centers) showed a four fold or greater rise in antibody titer of each group after immunization .No statistically significant differences were found in male and female children. Results are graphically presented in figure 2. The lgG anti-Vi antibodies of Peda TyphTM were 97.425 ELISA units in infants and children 3 months to 24 months of age. The geometric mean (95% confidence interval) of all volunteers was 70.32(62.86-78.66). The Vi conjugate typhoid vaccine (Peda Typh™) under clinical trial have been found to be highly immunogenic in infants and children less than 2 years of age in which unconjugated Vi polysaccharide typhoid vaccine is known to induce very low or nil immunogenic response. The efficacy of Vi conjugate typhoid vaccine in clinical trials conducted in Vietnam have been found to be 89% over the 46 months period. On comparing the data of clinical trial of Vi conjugate typhoid vaccine developed by N.I.H (Published in The New England Journal vol.344 no. 17, 2001 pg.No.1263-1269) with Peda Typh™ , it was found that the geometric mean post immune lgG(25-75 percentile) are statistically equivalent. Immunizations not only prevent mortality and morbidity. They also reduce the expenditure of public and private resources. The latest generation Vi conjugate typhoid vaccine is an effective tool to control the emerging pattern of typhoid fever in children and infants <2 years of age. Garg P., Garg S., Sharma M.K (2014), Clinical trial of Tetanus Toxoid Conjugated Vi Polysaccharide Typhoid Vaccine in infants and young children, Sharma et al (2014) Biotechnology International 7(4) : 90-100. Further post licensure studies on Peda Typh™ has been done in SRM Medical college Chennai by Dr. Balaji Chinnasami et al. Dr. Monjori Mitra et.al conducted a large scale Safety Immunogenicity & Efficacy study in Municipal school children in Kolkata (highly endemic area). Chinnasami B., Mangayarkarasi V., Prema A., Sadasivam K. & Davis M.J. (2013). Safety and immunogenicity of Salmonella typhi Vi conjugate vaccine (Peda Typh™) is children upto five years. International Journal of Scientific and Research Publication, Volume 3, issue 2, February 2013. Chinnasami B., Sadasivam K., Vivekanandhan A., Arunachalam P. & Pasupathy S. (2015). A study on Longevity of Immune Response after vaccination with Salmonella typhi Vi Conjugate Vaccine (Peda Typh™) in children. Journal of Clinical & Diagnostic Research. 2015 May, Vol-9(5). Efficacy of Peda Typh has been found to be 100% versus 33 cases of typhoid in control group over a follow up period of 1 year. One dose of the vaccine was found to give protective immunity in infants & children . No significant advantage of two doses regimen over one dose was found.”as per Dr. Chinnasami in his study “ A study on Longevity of Immune Response after vaccination with Salmonella typhi Vi Conjugate Vaccine (Peda Typh™) in children. 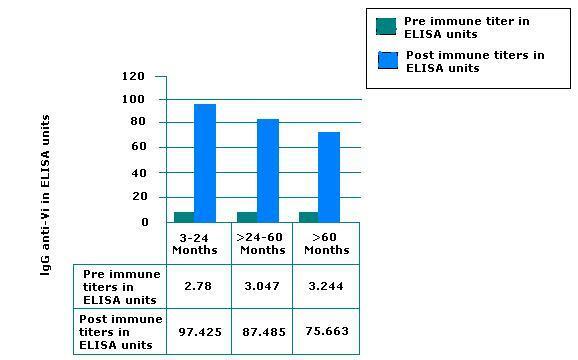 Serum analysis of post licensure follow up study at SRM Medical College using Peda Typh™ showed adequate immune response 30 months post vaccination with Single dose – 14 (4.8 – 29.8) µg/ml (which is much greater than earlier seroprotective level 3.52 Elisa unit equivalent to 4.36mcg/ml or current seroprotective level 1.4 µg/ml-2µg/ml).